ITBP Animal Transport Constable Recruitment/Exam PRIA-2018: Indo Tibetan Border Police released a new vacancy notification for the recruitment of available Animal Transport Male, Female jobs. There are total 85 posts in this ITBP Constable Assistant Transport Jobs Recruitment 2018. Written exam, physical tests will be conducted for this ITBP Constable TA jobs. Online application link will be active from 15-10-2018 to 13-11-2018 for applying these Constable Animal Transport jobs of ITBP Force. Admit card for this ITBP Animal Transport Constable Exam will be available in first week of December-2018. Written exam for this Constable Animal Transport jobs will be held major cities of India. Exam Pattern and Syllabus, physical tests details, physical standards, Age limits, salary, qualifications, online applications for this ITBP Constable Animal Transport jobs are mentioned below. 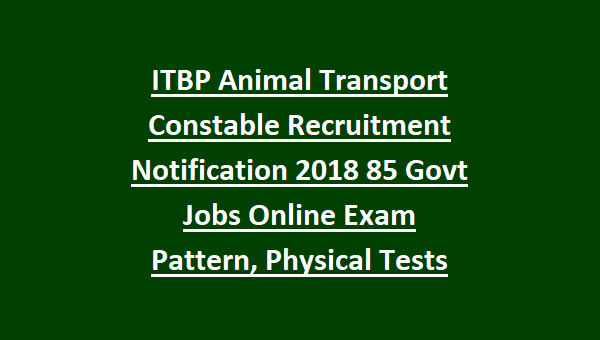 There are total 85 posts in this ITBP Constable Animal Transport Jobs recruitment 2018. As on 01-07-2018 candidates age limits are 18-25 years for all the posts. Age relaxations are applicable for reserved candidates as per ITBP norms. For SC/ST 5 years, For OBC-3 years and for Ex Serviceman as per ESM rules. Intermediate qualification is required for this ITBP Constable Jobs. Level 3 pay scale Rs.21700 to Rs.69100/- is applicable for these Animal Transport Constable jobs. For others application fee nil. Written exam, physical tests will be conducted for the selection of Animal Transport constable jobs. Physical Standard tests and physical endurance test details will be updated after the notification issued on 15-10-2018. Written exam will be conducted for 50 marks for this ITBP Animal Transport Constable Jobs. Total 50 questions will be given and exam duration is 1 hour. Written exam consists of 5 parts. 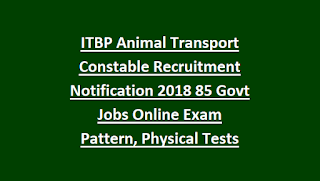 Candidates who are interested in this ITBP Constable Animal Transport jobs they can apply online through official website of www.recruitment.itbpolice.nic.in website. Last date to apply online is 13-11-2018.